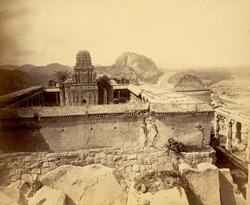 Photograph of the temple on Krishnagiri hill at Gingee in Tamil Nadu from the 'Archaeological Survey of India Collections: Madras, 1894-95'. Gingee is situated south-west of Madras and was established during the Chola dynasty. The fort at Gingee has been occupied by the Vijayanagara kings, the Nayakas, the Adil Shahi dynasty, the Marathas, the French and the British. It consists of three fortified hills; Krishnagiri, Chandragiri and Rajagiri. The citadel stands on the summit of the central Rajagiri Hill and it is protected by seven gateways. The temple in this view consists of a central shrine that is enclosed by a courtyard.